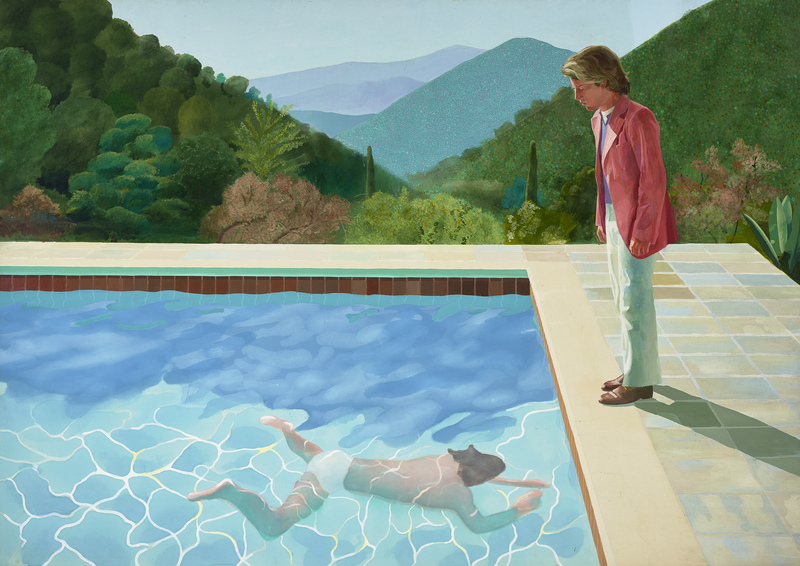 In celebration of his 80th birthday this year, the Tate’s recent large-scale exhibition ‘David Hockney’ (Feb 9 – May 29) opened last week at the Tate Britain. The show is the much-anticipated retrospective of an artist frequently lauded as “Britain’s best living painter”. Already established as a household name, Hockney has been especially prolific in recent years following several large-scale exhibitions at the RA, focusing on his landscapes and portraits respectively. By contrast to these, the Tate’s new exhibition spans a variety of mediums and subjects from the past sixty years, ranging from his early years at the Royal College of Art to recent iPad and iPhone paintings. The exhibition is laid out chronologically across 13 rooms, and unfolds much as a diary would. His early works are the most overtly autobiographical of those on display. As well as being a physical testament to his early forays into abstraction, the works also reference his sexuality, a courageous subject considering that homosexuality was still illegal in the early sixties. In 1964, Hockney made his first trip to California, the city which subsequently became his home for many years and inspired many of the better-known works of his oeuvre. The exhibition is not short of these, notably including A Bigger Splash (1967) Capturing the moment someone dives into a pool, the water is painted using a myriad of tiny brushstrokes; the laborious process and snapshot composition drawing intentional irony. This snapshot idea is later translated into the photo-collages of the eighties. Made up of a multitude of Polaroid photographs, works such as Bill + Audrey Wilder (1982) subvert the traditional viewpoint by depicting multiple perspectives at once. Portraits and landscapes are subjects that are consistently revisited by Hockney throughout his career, and this consistency serves as a nice touchpoint throughout the exhibition. Despite his change in styles, the exhibition itself flows clearly and logically, culminating in two pieces created specifically for this exhibition, Garden #3 (2016) and Two Pots on the Terrace (2016). The result? A well-curated overview of an artist whose works continue to influence and resonate, both in style and spirit. Having sold over 20,000 advance tickets, the exhibition is the fastest-selling in Tate’s history. We’d recommend booking in advance to avoid disappointment. David Hockney is showing at the Tate Britain until 29th May 2017. Tickets and further information available here.